skin. Skill will appear young and vibrant. general lack of vitality, concentration, eyesight, and mental weakness. gastric, gastric ulcers, migraine, blood circulation, and arthritis. 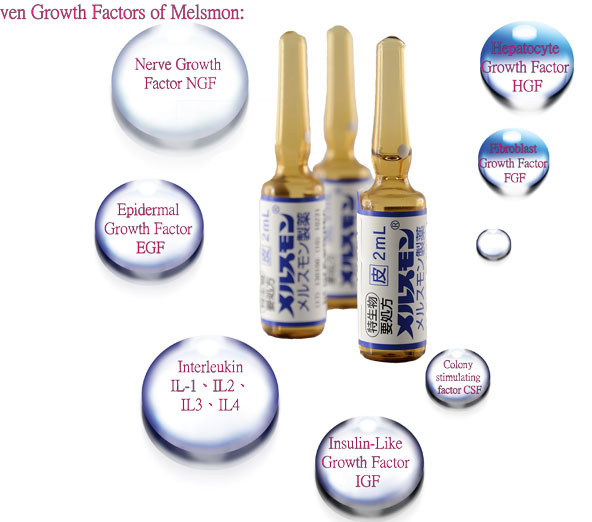 3) Melsmon prevents premature aging on organs such as brain, heart, lungs, liver, kidneys, and disgestive systems. 4) Melsmon promotes tissue respiration. 6) Melsmon cure epidermal problems such as wrinkles, decolorization, pigmentation, eye-bags, and dull skin tone. 7) Animea. Melsmon helps normalize blood characteristics. 8) After effect of illness. Melsmon helps replenish nutrients required by your body. 9) After surgery. Melsmon promotes wound healing and reduces recovery time. pain and changes associated with menopause.